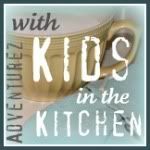 I am linking up with my sweet friend Kelli from Adventurez in Child Rearing for Kids in the Kitchen. This week there is no cooking and no recipe because 9 times out of 10 my kids are doing other things in the kitchen like messy crafts, science experiments or playing. We cut fish out of foam and put numbers, letters, colors on them so we could play some fun learning games. We put paper clips on the fish. Then used a ribbon with a paper clip attached to go fishing. I also added some blue food coloring to the water. VERY cute...and I can picture you standing on a stool over them to take those pics!!! I was on a stool and the counter!!! How fun! I love your creative ideas! !